Tissue Therapies Limited has identified that there is a significant need in wound care for improving the outcome of hard to heal wounds. Hard to heal wounds are defined as wounds that have not responded to standard therapy in an orderly and timely manner . This type of delayed healing occurs in a variety of wound types (venous leg ulcers, arterial leg ulcers, mixed leg ulcers, diabetic foot ulcers and pressure ulcers) [1,2,3]. Nursing time, was associated 33-41% of the total cost of care and the cost of wound dressings were associated with 17-22% of the total cost of care. Clearly there is an opportunity to provide a technological solution that reduces the time and resources taken to resolve hard to heal wounds, in addition to providing improved patient outcomes. Tissue Therapies Limited has a worldwide exclusive liscence from the Queensland University of Technology to commercialise VitroGro® ECM. VitroGro® ECM is a new treatment for hard to heal wounds that is used in conjunction with standard care, including moist wound dressing and compression. With VitroGro® ECM, Tissue Therapies Limited is placed to meet the need for reducing the burden of hard to heal wounds for both the patients and the healthcare system. What is VitroGro® ECM and how does it help? VitroGro® ECM is a topically applied, biomimetic scaffold, comprising a synthetic extracellular matrix (ECM) protein. 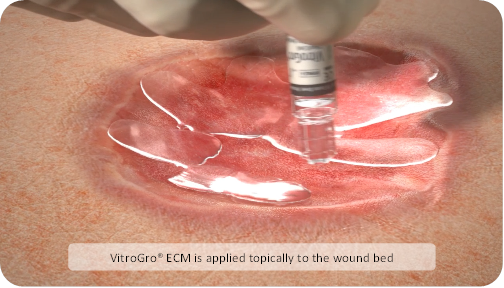 How it works:VitroGro® ECM replaces the degraded matrix of a hard to heal wound. VitroGro® ECM binds to a prepared wound bed and provides a physical structure (a scaffold) for cell attachment, which is a primary requirement for subsequent cell functions critical for healing, such as cell proliferation and migration . 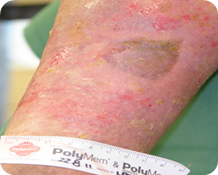 One of the characteristics of hard to heal wounds is prolonged inflammation, which damages the native ECM that would normally guide the wound healing process [7,8,9,10]. Replacement of this damaged ECM is a beneficial strategy for treating hard to heal wounds . An ideal ECM replacement would be one that closely approximates the structure and function of the ECM it is replacing . VitroGro® ECM is ideal as an ECM replacement because its design is based on proteins that are present in the physical structure of healthy ECM in the early stages of normal wound healing. In the VITRO-CARD-1001 study in addition, to the achievement of clinically meaningful healing and wound area reduction, patients also achieved substantial pain reduction. Many countries are currently experiencing health budget austerity. Wound care is a growing health issue and there is now unprecedented focus on wound care products to address the clinical and economic burden. We are developing wound care products designed to improve the quality of patient lives and reduce the cost of wound care. We see opportunities to have significant impact in wound care markets in Asia, Australia, Canada, Europe, New Zealand, the United States and other markets experiencing the economic burden of wound care. We are also continuing to work with our research and development partners to create more effective, complimentary products for wound care and tissue repair. Tissue Therapies Limited operates with a partnership structure to optimise revenue, flexibility, control and minimise risk. We have partnered with established companies with proven track records. Tissue Therapies Limited is committed to understanding the needs of our customers and patients. We are institutionalizing a culture of quality and performance management into our development and manufacturing control processes. Our management systems are certified in compliance with the requirements of ISO 13485: 2003. Vowden KR. 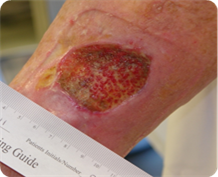 and Vowden P. The prevalence, management, equipment provision and outcomes for patients with pressure ulceration identified in a wound care survey with one English health care district. J. Tissue Viability 2009.